There are main 13 clotting factors that help in the clotting of the blood. This process is also called coagulation. In this process blood changes from liquid to a gel like substance which is called clot. This is a protective mechanism which keeps the blood from loss after injury. 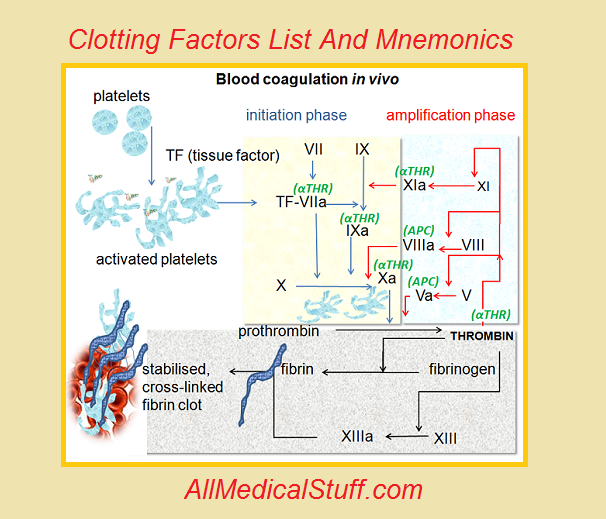 Absence of any of these factors results in various diseases, which are listed below in clotting factors table. Clotting factor may be defined as ” the substance or group of substances that help in clot formation (coagulation) is called clotting factor. Clot formation/ coagulation is not a one step process. There are two different pathways i.e intrinsic and extrinsic pathways of coagulation. 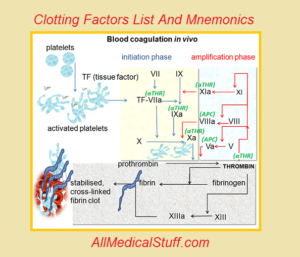 All of these factors are involved in different steps of clot formation. And missing of any of these factor causes various clotting diseases such hemophilia. In order to learn about the diseases and the steps in which each of these factors work, you should read detail below or look at the table. We have a pdf guide in which all the clotting factors are discussed in detail. You can download it from here. sorry i don’t have time. but i can write on topics for you on this blog.